« 2012 Energy Shift… Sooner Than Expected? Last month I went to an area with a powerful vortex of energy coming off the ground. The sacred circle is located in a rocky desert mountain about an hour drive from the Nazca lines in Peru. It is far from any civilization so it is very dark at night… although the moon was strong that day. I went there with the owner of an hotel who offered to be a personal guide and the chef of a small community living near that circle. They said we could see energy on digital pictures. Sounds cool. Let’s try it! We had to cross the river twice to get to that area, and the river is dry 8 months per year. When we got there, we took our shoes off and I went inside the circle. I felt a powerful surge of energy emanating from the ground and the circle was about 50 meters wide. They took pictures of me with my own digital camera with flash, a Canon IXUS 800IS. 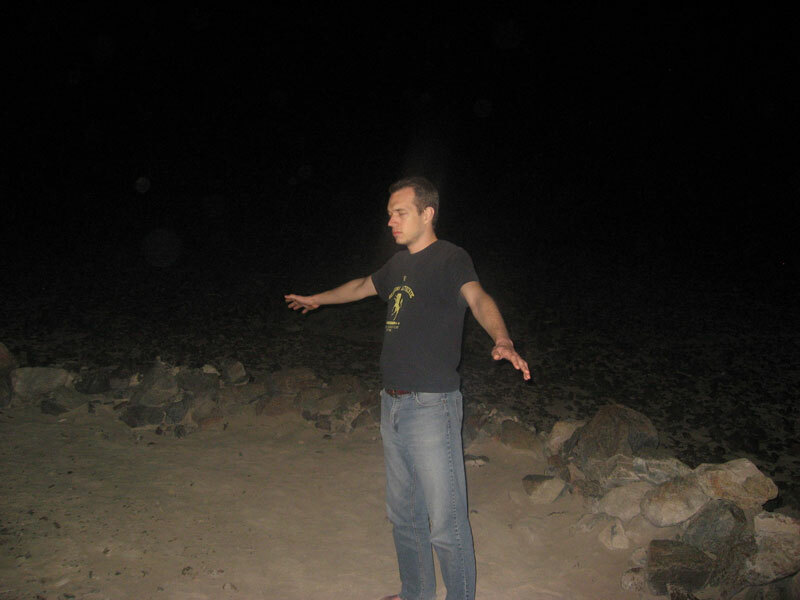 On some pictures we can see orbs and some of the orbs appear very large. They say the orbs are energy that appear on the picture. Could it be prana particles? I don’t know. The way I see it, energy is a fluid and not a particle. Plus, dust and humidity can cause that kind of artifact on a picture with flash. I wasn’t convinced but I loved the energy of the place. I started meditating and connecting me to the depths of the Earth. At some point I pulled a huge amount of energy off the ground. What a shock when I saw the pictures taken at that point! You can clearly see a halo of light around my arms and above my head. Although the orbs are debatable, this halo is much harder to explain! This was the first time I could see energy on a digital picture. I can’t explain this phenomenon. Why does it appear here when it normally never appears on pictures? Does energy alter visual rays in our daily life on a very subtle level or on non-visible frequencies? If not, at what point does energy starts to alter visual rays? After a month, I still don’t have any answers and I’m bringing the question out. In what conditions does this phenomenon happen? First, it has to be very dark which is difficult in a city. Second, the energy needs to be very intense. The halo only appeared on my pictures and it only appeared at that point where I was lifting the most intense amount of energy. 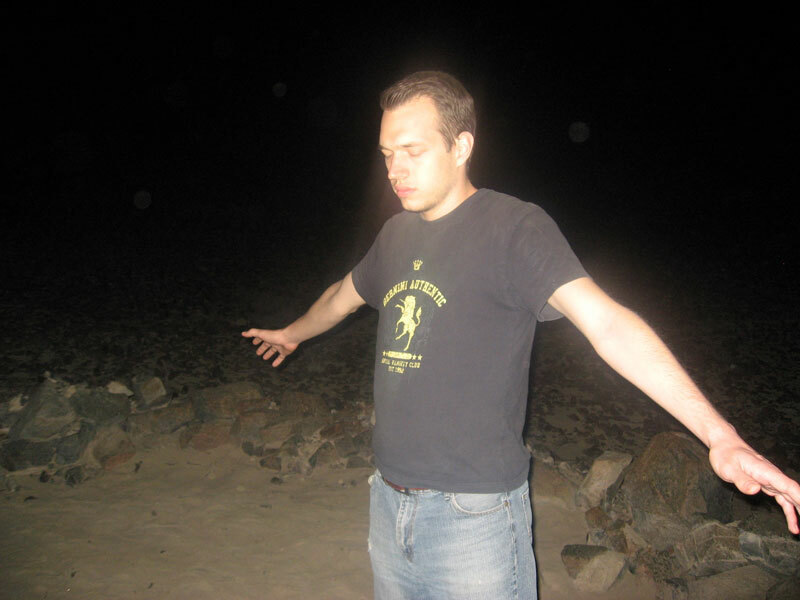 Pictures of other people only included orbs. The halos are not a blur caused by camera movements because the background is very clear. If anyone has any explanation about how can spiritual energy alter visual rays to appear in a digital photography, I would love to hear what you have to say. P.S. Update about last post about the 2012 Energy Shift and Comet Elenin: it appears that the comet has been hit by a solar flare and is disintegrating. Thus, it may not have the expected impact. This entry was posted on September 19, 2011, 4:45 pm and is filed under Emotions and Energy Healing, Science of Spirituality, Spirituality and Philosophy, World Evolution. You can follow any responses to this entry through RSS 2.0. You can leave a response, or trackback from your own site. Awesome! It’s not that spiritual energy distorts visual rays. It’s simply that living organisms always emit light… about 1000 times weaker than what our eyes can perceive. I simply amplified the existing phenomenon. You may not believe I saw your energy on your arms like seeing aurora; I have a vision just like x ray and been training for many years. Will be good we share some know how?s because I am a electromagnetic person for over thirty years and I created only with meditation. I like to tell you in Canada jus the border of Alberta and British Columbia the water on the crick run up and the cars without brakes on could go up, this also in Brasil the same up down words the car have to use engine, and without brakes goes up. You know science have been discovering many, but many could be discover, and the human brain could do marvelous things to do with electromagnetic, like stops engines, or even some electronics. I have being doing things which even me I feel amazing too. Also levitating , and has you know we have two brains, the left and right, the left part are the one doing the most works and the right most for vision. Already knowing about this the scientists; but because of such I could looking in three dimensions just about any picture and on the mirror I could block with my mind to be able to see one, three and four eyes. I did using my vision like a telescope in a very dark night to see above the stratosphere and than even sow three presumed UFO not earth satellites, because it speed for a few times between the three of them. Like two took of to my left and the other one afterwards even to a speed that was of like a comet, but this did not have had a tail like most do. Just like racing around the stars, and I seen competing like jests above the skies in our counties. I was amazing and did not mention to many people. It is nice we gain knowledge when we know not many could the way we do. You doing very well and do not stop never for what we doing and about thing I know a way from normal, I may sent to you and you could studding for youself. I don’t see any halo or particles in those photos. Some old cathodic monitors don’t display colors well. Make sure you look at it with a good monitor.